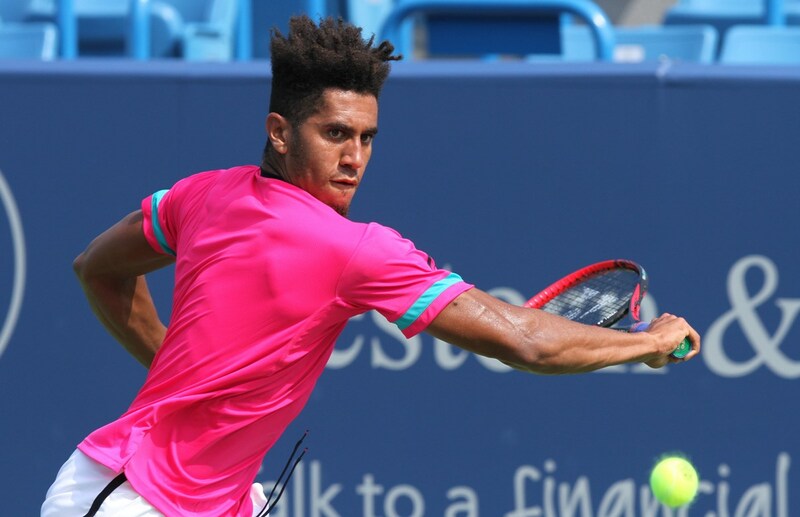 Third-year ATP Tour pro Michael Mmoh, 20, advanced with an efficient 6-3, 6-3, 68-minute upset of (13) Mirza Basic, who opened the tournament No. 84 in world rankings. Mmoh's victory builds his solid run to the Los Cabos, Mexico quarterfinals last week. Bazic slips to 0-2 in ATP Masters 1000 events this season. An entertaining tilt between top qualifying seed John Millman and Tim Smyczek was unfortunately brought to a premature close after 48 minutes of play when Millman was forced to retire with back ailment. The abbreviated affair featured strong serving performances with Smyczek landing 94 percent of his first attempts and Millman delivering on 87 percent of his initial offerings. Smyczek, 30, also converted 11 points on second returns en route to his fourth W&S Open qualifying-round victory through eight appearances. He'll take aim at his first tournament second-round qualifying victory tomorrow. Denis Kudla took his first steps toward a second consecutive visit to the W&S Open Round of 64 with this tournament qualifying victory. Kudla ripped eight aces with an overpowering service game and was 27 for 27 in first-service wins. He manufactured a 36 service points in the victorious effort. Bradley Klahn and J.J. Wolf rounded out the Americans advancing to the second round. World No. 174 ranked Allie Kiick, 23, made a memorable W&S Open debut by knocking off 2010 U.S. Open champion, nine-time tournament winner and World No. 65, Samantha Stosur. Kiick produced three aces and won 17 of 26 first service opportunities in a tight first set that went to a tiebreaker. She won 19 of 23 first services, was 2-for-4 on breaks and notched nine second return points while pulling away from the hard-hitting Stosur in the second set. USA's Jennifer Brady, Sofia Kenin, Jamie Loeb, Vavara Lepchenko, Christina McHale and Bernarda also moved on to Round 2. Cincinnati amateur J.J. Wolf (USA) opened a new chapter in one of the city's most long-standing family athletic legacies by balttling to a 7-6(6), 7-6(5) upset of world No. 85 Josef Kovalik (Slovakia) in the final match of the day. Wolf, 19, attended high school at Cincinnati Country Day and currently competes with the Ohio State Buckeye's men's tennis squad, with which he earned 2017 Big Ten Conference First Team and ITA Midwestern Region Rookie-of-the-Year honors. The teenager was able to force a first-set tiebreaker while finding his comfort level. "The whole first set, I was feeling a little on edge. It wasn't nerves or anything, just couldn't really find my game. I think where I really found it was in the tiebreaker. That's where I stepped it up and started playing right," Wolf said. He relied on support from a hometown crowd, made up of numberous family members and friends, to fight through a tight second set. "It kind of makes you grow 'a foot' when you have that many great fans behind you. It helps you settle in. I wasn't playing great and I kept telling myself, 'next point, next point, they'll pull me through,'" he added. World No. 37 and last week's Washington, D.C., finalist, Donna Vekic, rolled to a 6-3, 6-3 victory in her first meeting with Andrea Petrovic. Vekic, who advanced to her fourth all-time and first tournament final since 2015 in our nation's captial, overcame four first-set and a combined six double faults, in part, by winning 79 percent of her first serves. Today's first-serve struggles may be attributed to a bit of fatigue following last week's 31-game final against former U.S. Open and former French Open champion, Svetlana Kuznetsova (Russia). While young Americans were establing a tone, several ATP and WTA veterans displaying solid qualifying-round form. World No. 93 Marcos Baghdatis, 33, represented this year's W&S Open veteran corps well with a mild upset of world No. 73 Feliciano Lopez, 36, in the opening round. Baghdatis, a 2010 W&S Open semifinalist, prevailed in the hard-fought first set by firing 6 aces and winning 21 of his 23 first serves. He was especially stout in the second set when launched 6 aces, went a perfect 14-for-14 in first-serve wins and did not double fault. He moved his all-time tournament record to 11-7. The 2006 Australian Open finalist advanced to Cincinnati's Round of 16 three times and Round of 32 five times in eight previous appearances. Stefanie Voegele (Sweden), Vavara Lepchenko (USA), Ivo Karlovic (Croatia) and Guillermo Garcia-Lopez were notable veterans advancing to the second round.